Some time ago I posted a few entertaining images from the 1894 Lyon & Healy music catalog (see also here). 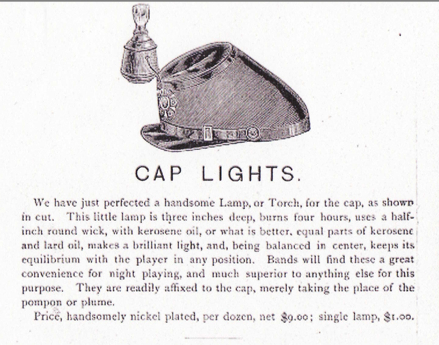 Below is another interesting offering, this one from the 1880 catalog. The cap’s miniature kerosene lamp, it explains, burns for up to four hours and is “a great convenience for night playing.” Just be sure not to trip and fall!